It has been decided that we are going to have the women wrestle on Sunday at the State Tournament instead of spreading them out over a two-day period. Please plan accordingly. FARGO, N.D. — Three All-Americans wasn’t cutting it for Team Ohio, so the Buckeye state doubled its fun. 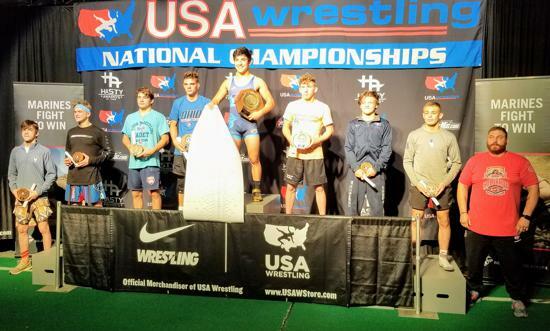 With no finalists and just three All-Americans a year ago at the U.S. Marine Corps Cadet Greco-Roman Nationals, Ohio went back to work and found its way to the podium with six All-Americans. What’s more, Ohio crowned champions in Davin Rhoads (126) and Alex Coleman (285) and had six All-Americans. Coleman’s was over before you could blink as the freestyle All-American pinned four-time All-American and freestyle runner-up Colby Whitehall of Pennsylvania in 14 seconds. No sooner did the referee blow the whistle than the state alternate had Whitehall on his back looking for the fall. That thinking is undeniable considering Seth Shumate (4th, 170), Aaron Morton (4th, 160), Daniel Sugura (5th, 145) and Brent Paulus (6th, 195) also reached the podium, proving that Ohio is on the way up after a down season in 2017. For Ohio it’s more of a brotherhood as the one unifying factor in it all was constant practice to help improve each other both mentally and physically. Rhoads, who missed out in the blood round of freestyle, refocused and looked at one goal. When that goal of being an All-American turned into being a national champion, instead of crediting himself, he credited the process. Practice makes champions, but facing top-flight competition in the practice room is what brings home stops signs from the FargoDome. FARGO, N.D. — Tug on Superman’s cape and you feel the pain. Every year, Team Ohio comes out to the U.S. Marine Corps Nationals in Fargo, N.D., and every year, things turn sour for opponents. 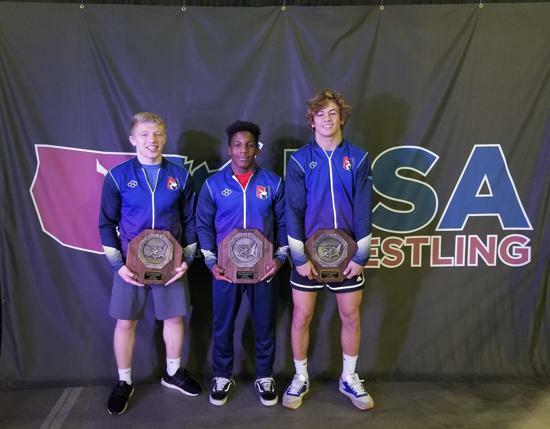 While the national team title eluded Ohio again, the Buckeye state repeated its runner-up finish behind Illinois and crowned champions in Jordan Decatur (132 pounds), Bryce Andonian (145) and Carson Kharchla (170) with Gabe Tagg (138) finishing second. That’s hard to ignore with Julian Tagg (3rd, 120), Connor Brady (3rd, 152), Dustin Norris (4th, 113), Colin Noel (6th, 100), Dylan D’Emilio (6th, 132), Jordan Crace (6th, 138), Nevan Snodgrass (6th, 160), Victor Marcelli (8th, 182) and Matthew Cover (8th, 220) grabbing All-American status. That can’t be denied as the practice room at Ohio Northern University where the team trains looks like a who’s who among the state’s best. So is the coaching and that isn’t lost on the wrestlers. FARGO, N.D. — Grab the sunscreen, the future is once again bright for Team Ohio. 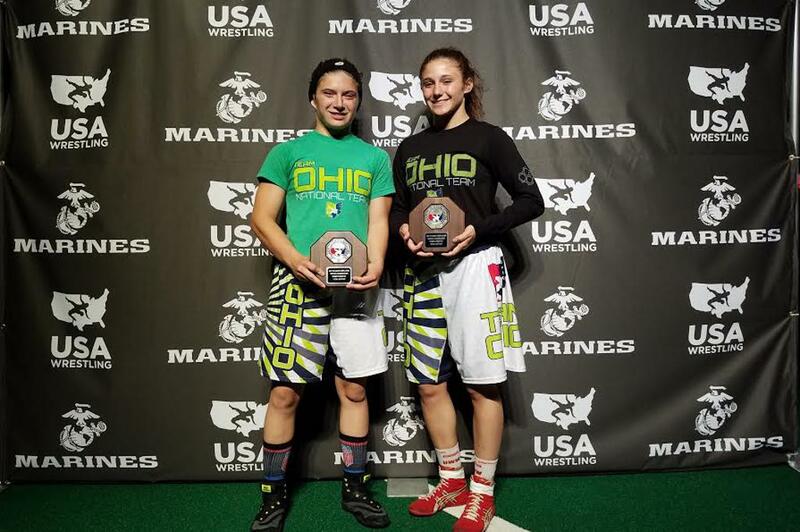 Competing in Fargo, N.D., at the U.S. Marine Corps Cadet Freestyle Nationals, the Buckeye state repeated the feat and finished second in the team race. Burnett (126 pound) and Luke Geog (138) paved the way with second-place finishes, while Jake Niffengegger (132) and Alex Coleman (285) were fourth. Marlon Yarbrough (88), Derek Fields (132) Seth Shumate (170) and Ethan Hatcher (182) finished fifth and Sean Seefeldt (100) and Kyle Rowan (106) finished sixth. Riley Ucker (220) was seventh with Noah Ewen (152), Brent Paulus (182) and Garrett Lautzenheiser (113) finishing eighth. “We wanted to push really hard to get that team victory,” Geog said. “Everybody came together with the thought of getting that individual victory. It worked together to build one strong team. One of the most intriguing teams in the field, Team Ohio fell behind only Pennsylvania, who had the same amount of All-Americans but had two state champions. Undaunted, Team Ohio formed a brotherhood and came together as a solid unit. TULSA, Okla. — Call it a warning. Label it a wonderful team effort. 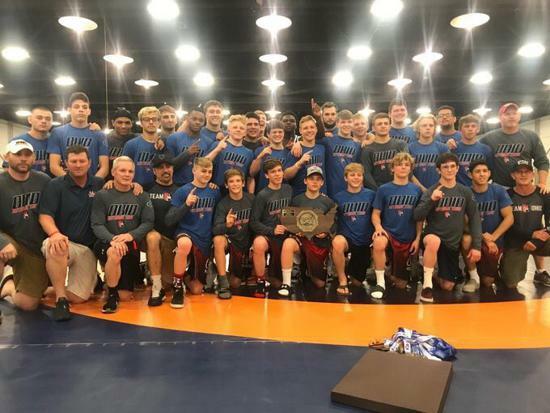 But one thing is for sure, the rest of the country was put on notice at the Junior National Duals in Tulsa, Okla., as Ohio blitzed the 34-team field and walked home with the national title. With the UWW Nationals just around the corner, the message was sent that stop signs may be the color of a buckeye as Team Ohio heads to Fargo, N.D. next week. That scenario played out over and over as Voinovich joined Logan Agin (113), Lucas Byrd (120), Jordan Crace (138), Colt Yinger (170) and Antonio McCloud (220) as undefeated wrestlers. With five state champions and nine other state placers crowding the lineup, Team Ohio blurred through pool play by beating North Dakota 53-15, Washington 46-17 and the Oklahoma Outlaws 38-30. “It’s a good feeling,” Crace said. “We kind of have a target on our backs now, so you know kids are gunning for you. You have to be ready to wrestle. It showed as Team Ohio continued through the bracket with Kyle Rowan (100), Cole Skinner (106), Agin, Dustin Norris (113), Byrd, Conor McCrone (126), Dylan D’Emilio (132), Crace, Voinovich, Kevin Contos (152), Nevan Snodgrass (160), Yinger, Trey Sizemore (182), Matt Cover (195), McCloud and Jordan Earnest (285) using the momentum to roll. A 57-8 quarterfinal win over Colorado was a precursor to a 53-13 semifinal win over Missouri. That brought a tough Minnesota team that gave Ohio everything it had before falling 33-32. The match was still in question until McCloud beat Cole Filbranz, 13-2. The idea to win it all wasn’t fostered in pool play or as the team advanced in the brackets, but in the Greco-Roman tournament where Ohio finished fourth. With freestyle up next, it was more a matter of when and less about if the team could do it. All three Greco-Roman and Freestyle STATE Championships (i.e., Kids/Schoolboy and Cadet/Junior/Open) are for Ohio residents only. Vic Marcelli grabbed his fifth All-American honor in Fargo, N.D. He was the lone placer for Team Ohio in the Junior Greco-Roman National Tournament. FARGO, N.D. — Thirty-five hopefuls from Team Ohio entered the Junior Nationals hoping to become a Greco-Roman All-American in Fargo, N.D. When the 894-wrestler field was whittled down in the middle of the second day of the three-day tournament, only 182-pounder Vic Marcelli was left from the Buckeye state. The Massillon Jackson senior could have looked at the situation and wilted under the pressure. He could have packed his bags and set sights on his high school senior year. Instead, Marcelli used the situation as a badge of honor and one where he defended the great name of Ohio wrestling by finishing fifth. By beating Alabama’s Christian Knop, who was a Southeast Regional champ in both Greco and Freestyle, Marcelli nabbed his second All-American honor of the week and now has five with three coming in Greco. It was the second time Marcelli doubled in Fargo, after doing it two years ago at 160. Fast forward to this year and Marcelli finished things with a 5-0 win where he was never seriously threatened by Knop. “It’s just wrestling to my potential,” Marcelli said. “Being able to double AA out there feels good. As he enters his senior season, Marcelli will take some time off as will most of the rest of Team Ohio, but knows he’s a better wrestler because of his time in Fargo. Whether it was the regiment of controlling his weight, working through the rigorous practices Team Ohio coaching puts you through or just maneuvering your way through the minefield of competitors the competition puts you through, when you come out the other side, you’re better for it. Marcelli has seen himself become a more refined, stronger wrestler every time he comes back from North Dakota. He also sees his game get strong mentally as well. He knows it’s up to him to take that next step. Victor was a double AA for the 2nd time in 4 years! 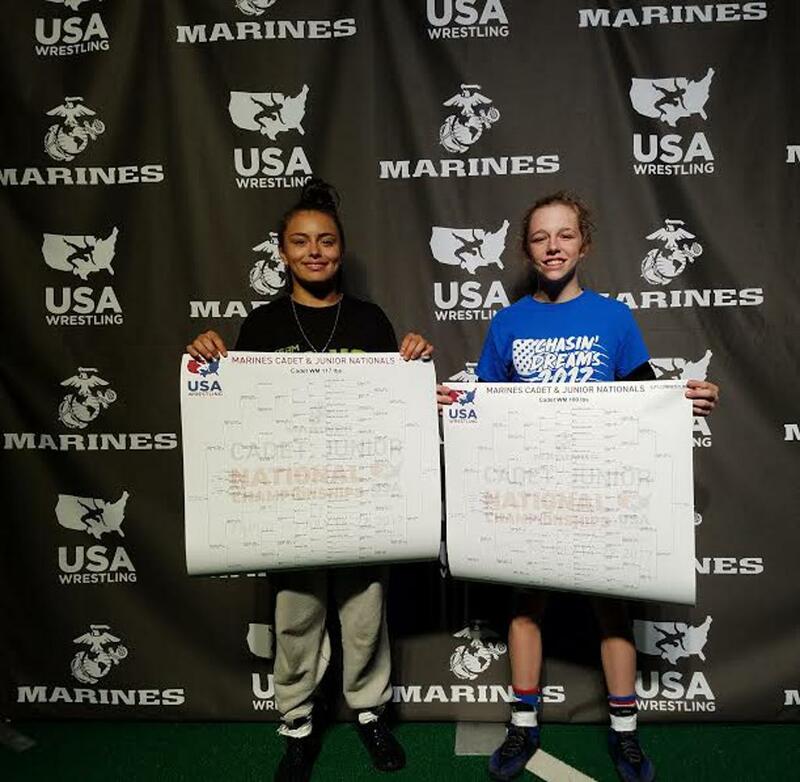 Autumn Gordon (left) and McKayla Campbell ended incredible careers with Team Ohio by finishing second at the Junior Freestyle Nationals. Jr Women's Freestyle finished 12th in the country with just 9 girls on the team and had 2 National Runners-up! 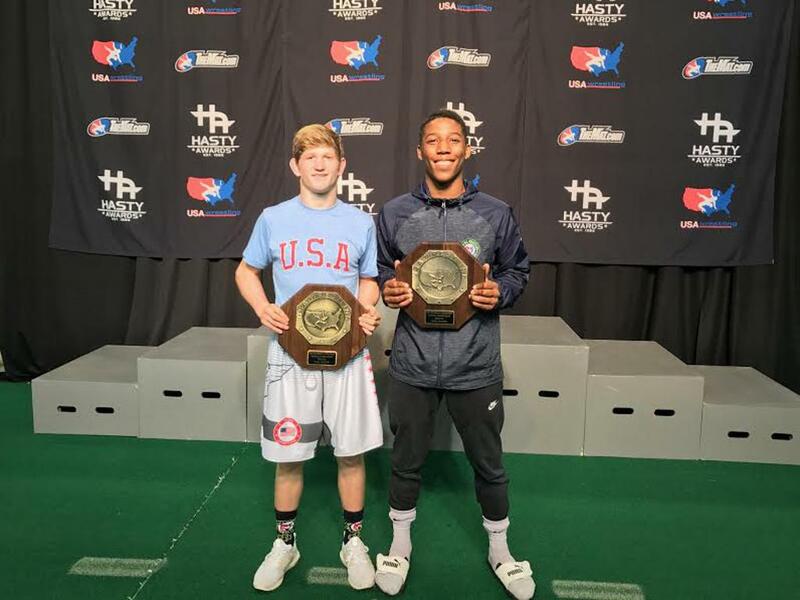 While the duo didn’t grab a Junior Freestyle National championship in Fargo, N.D., the legacy the two have forged isn’t lost on anyone familiar with the wrestling. “They showed what the expectation is going to be for Team Ohio,”coach Lauren Lourvie said. “They raised the bar and showed the girls how to do it. The other 15 girls we had on the team now see what it’s supposed to look like and what’s supposed to be done. Campbell (106 pounds) has been the standard bearer in Fargo for a long time for Team Ohio. A six-time finalist, Campbell owns two titles from 2015. Unfortunately, a 2017 title wasn’t in the cards for Campbell, who scored a late takedown to tie things with Pennsylvania’s Vayle Rae Baker, but lost on criteria. Disappointed, but undaunted, the Wauseon graduate knows she’s leaving the team in a good place. “From where it started four years ago, it’s grown so dramatically,” Campbell said. “It’s crazy to see where I’m at right now with all these girls. I started with four girls on the team and now there’s 17. It’s crazy to see where they’ve come from and how hard they’ve trained to get where they are right now. Gordon (112) fell short in her bid in a 10-8 loss to Wisconsin’s Alisha Hawk, but knows the team is on the rise. A national folkstyle champion, Senior Open placer and International Brazil Jiu-Jitsu Federation World champion, hard work and determination put her in the finals. 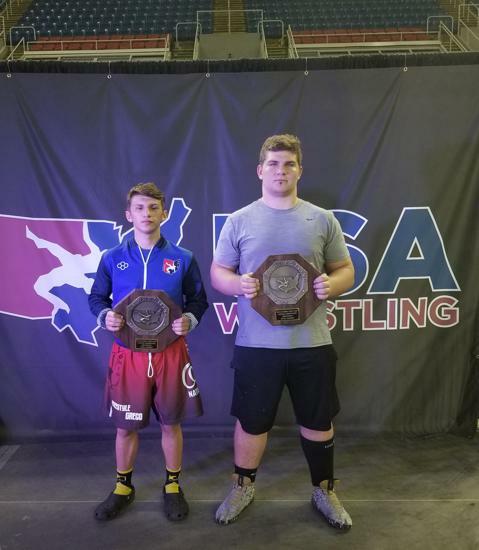 In the Cadet Greco-Roman Tournament, Matthew Cover (4th, 195) Louden Haga (5th, 285) and Brett McIntosh (7th, 152) placed for Team Ohio. (Photo by Jeff Kullman) Drew Mattin (left) and David Carr won Junior Freestyle National titles in Fargo, N.D., to help Team Ohio to a runner-up finish. 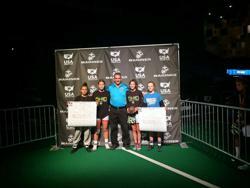 With two champions and two other All-Americans the girls Cadet Freestyle team finished ninth at Fargo, N.D. Wrestlers will go to the end of the earth to grab a stop sign. 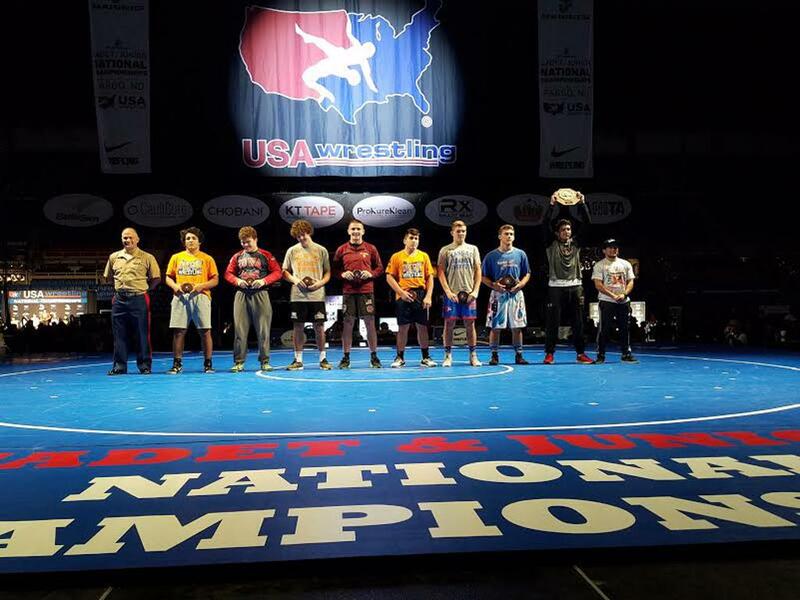 The eight-sided plaque given to All-Americans at Fargo, N.D., the Junior Freestyle Nationals are arguably the pinnacle of high school wrestling. Team Ohio pocketed them like they were candy Tuesday through hard work, dedication and a drive few have seen. There was more fun to be had and it started with David Carr (160), who picked up the one thing he didn’t have. Well, two things he didn’t have. The three-time state champion felt a little push with six technical falls among his seven wins. It ended with the big stop sign after a 13-3 win over UWW Junior Greco-Roman champion Tyler Dow in the finals and gave him the most outstanding wrestler award — an award Ben Darmstadt won last year for Team Ohio. No one might have wanted it more than Drew Mattin. A runner-up at the Cadet level two years ago, Mattin lost in the quarterfinals last year at the Junior level. That made his swan song at Fargo before heading off to the University of Michigan a pressure cooker. Mattin came through in spades, knocking out Folkstyle Junior Nationals champion and returning runner-up Paul Konrath (126 pounds) of Indiana 8-1. Carson Kharchla (4th, 160), Antonio McCloud (4th, 220), Dakota Howard (5th, 195), Jon Spalding (6th, 285), Vic Marcelli (7th, 182) and Tommy Hoskins (7th, 120) made it an even dozen All-Americans as Team Ohio finished second. Admiration for the stop sign shined through in the girls division as well as a Cadet Freestyle title was won by Olivia Shore (100). The World team member and UWW Cadet National Champion handled Washington Freestyle champion Kenzie Cormier with a 12-1 technical fall. Leilah Castro (117) breezed to her title as well. The Folkstyle national champ added a Freestyle crown to her resume with a 12-0 win over two-time Schoolgirl Folkstyle runner-up Sophia Smith. Team Ohio showed strong in the team race as well. With its largest to date, it finished ninth with Taryn Martin (2nd, 94) and Cassandra Smith (7th, 138) also finding spots on the podium. Junior Men's FS Team has 2 National Champs, 6 All-Americans, and finishes 2nd in the US!! David Carr was also voted MVW for the tournament! Cadet Women FS Team has 2 National Champs, 1 runner-up and a 7th place to finish 9th in the USA! Olivia Shore (100) NATIONAL CHAMP! Leilah Castro (117) NATIONAL CHAMP! Leilah Castro (left) and Olivia Shore proudly display how they navigated their way to Cadet Freestyle titles in Fargo, N.D.
Mattew Cover (third from right) was one of 12 All-Americans for Team Ohio in Cadet Freestyle. FARGO, N.D. — Based on what happened over the weekend, Team Ohio is ready to take that next step. Competing in the Cadet Nationals at Fargo, N.D., the Buckeye State finished behind only Illinois and made its usual statement at the event. 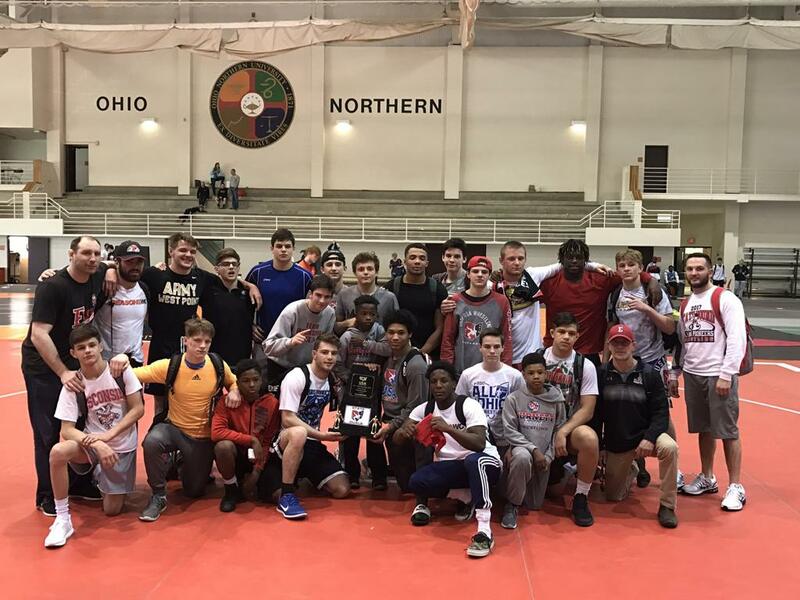 While there weren’t any champions, Team Ohio had 12 All-Americans and proved once again if wrestling is the topic, it’s best to look towards the Northern half of the United States. Louden Haga (285) echoed those statements with his runner-up finish. 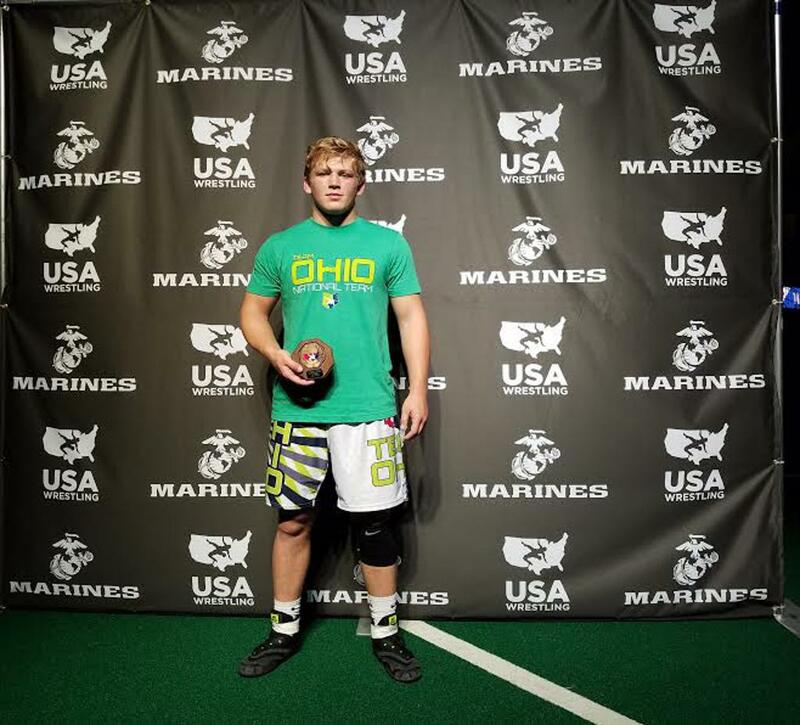 Like Braxton Amos last year, Haga is from West Virginia, but represented Team Ohio because he did the same in the National Duals (West Virginia doesn’t have a duals team). While Haga wasn’t able to figure a way around South Dakota state champ Nash Hutmatcher in the finals, he walked out impressed with what Ohio had to offer. Cover and Haga had some company as Victor Voinovich (3rd, 132), Nevan Snodgrass (3rd, 152), Rowan Madison (4th, 94), Dylan Shawver (5th, 113), Christopher Donathan (5th, 152), Mick Burnett (6th, 120), Gus Sutton (6th, 138), Paddy Gallagher (6th, 138), Dustin Norris (7th, 100) and Brett McIntosh (8th, 152) made the podium a traffic jam of Buckeyes. That’s just how Ohio rolls as it looks to stay in the talk for a national championship year after year. “This tournament is the toughest in the country,” Cover said. “You get to see some of the best in the country. If you lose, you learn from it. If you win, you’re a national champion. Everyone helps each other. You wrestle the best. More than that, what Team Ohio did was kickstart the high school season. 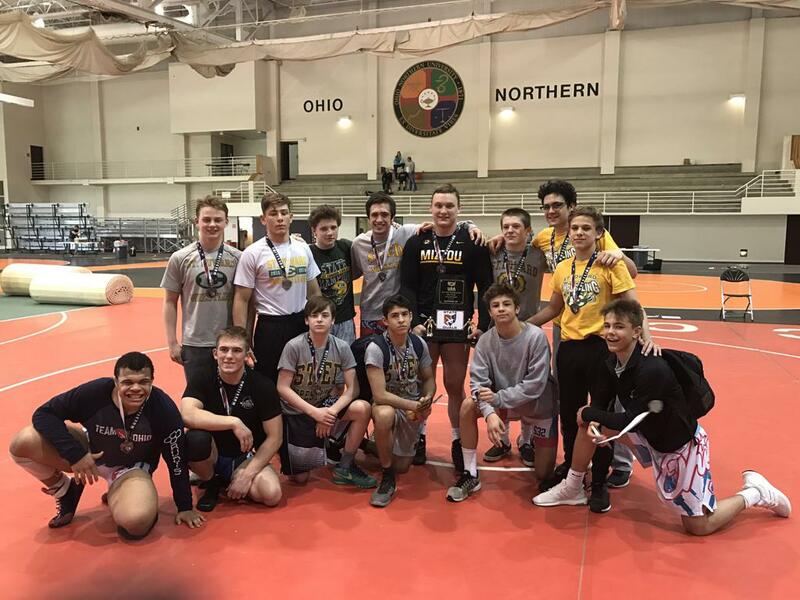 While many of the Cadets are expecting big things at their respective schools, lessons learned not only in Fargo, but especially in the camp at Ohio Northern prior to the season will go a long way come next March at state tournaments. Cadet Men FS finishes 2nd in the US!!! Way to start us out in Fargo. Matthew Cover (195) Natl runner-up! Louden Haga (285) (WVA/OH) Natl runner-up! COLUMBUS — Do you have state dreams? Better get your USA wrestling card. Those who succeed at the OHSAA state tournament know the mat isn’t a four-month process. It’s a year-round passion and many of those that found success on the mats last weekend began the summer either at Fargo, N.D., at Nationals or wrestled for USAW in the spring. While that might sound like a public service announcement, facts are facts and USA Wrestling breeds champions. 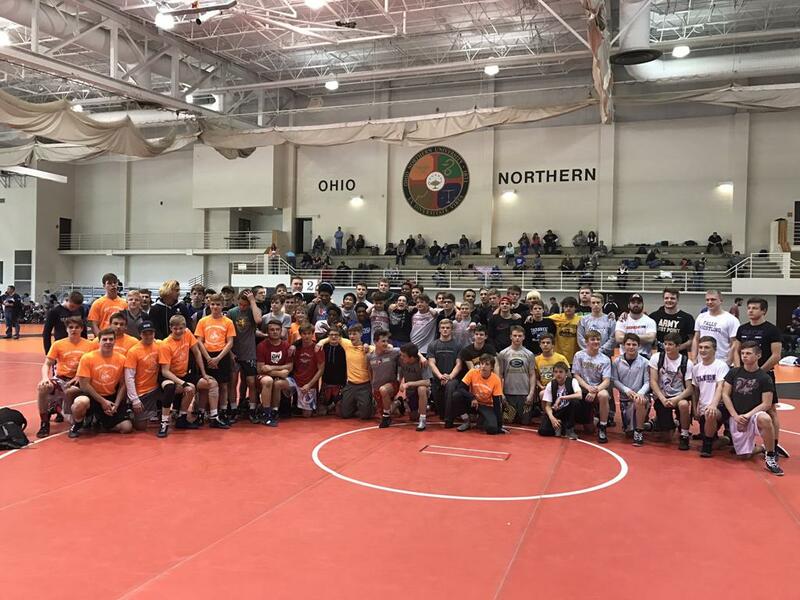 The NCAA Division I Nationals where 28 of the 32 Ohio competitors wrestled in USAW aside, it starts at the high school level and it starts off in the summer. Going into the state tournament, 52 percent of Division I wrestlers had USA cards in 2016, 43 percent in D-III and 34 percent and 34 percent in D-II. What’s more, 29 of the 42 champs cut their teeth on USA Wrestling with 12 of the 14 coming in D-I. That’s 69 percent of all state champions. Add in USAW card members from 2015 and it bumps up to 86 percent. “It totally prepares them,” USAW and Elyria assistant coach Jack Gillespie said. “If you look at our program, everybody that has been a Fargo All-American pretty much has been a state champ. If you’ve been a FILA Cadet champ, you’ve qualified and placed. To put that in perspective, in 20 years, Burnett has had 42 wrestlers reach the podium and crowned 10 champions. That’s 93 percent wrestling in the summer and that’s just one school. But take the words of a coach, wrestlers feel the same way. The 106-pound freshman isn’t just a state champ, he’s a cadet national freestyle champ, having won the title last summer. La Salle’s Lucas Byrd, who Tagg beat in the semifinals, finished third and will return to Fargo next summer as a cadet Greco-Roman runner-up. More than that, winning or even placing on a national stage helps. Elyria’s Dylan Shawver (113) went out to Fargo and earned cadet freestyle All-American status. He beat returning runner-up Gabe Tagg, another USA wrestler, to open the tournament and finished fourth. Tagg, by the way, exacted his revenge in the third-place match. USAW breeds confidence as well. When Spencer Berthold pinned his way to the championship match at 220 in Division I, it not only marked the first state placer for Midview since 1988 (Adam Duke, 4th), but the first state finalist since 1985 (Carlos Martin, 98 pounds). He finished runner-up, but pointed to USAW as the catalyst. “I’ve been lifting a lot,” Berthold said. “I didn’t ‘AA’ out (in Fargo) and that just pushed me even more. It made me want it even more. How can I do it if I don’t believe in myself?